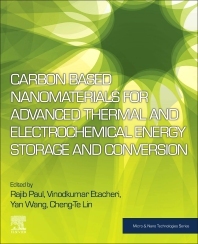 Carbon Based Nanomaterials for Advanced Thermal and Electrochemical Energy Storage and Conversion presents a comprehensive overview of recent theoretical and experimental developments and prospects on carbon-based nanomaterials for thermal, solar and electrochemical energy conversion, along with their storage applications for both laboratory and industrial perspectives. Large growth in human populations has led to seminal growth in global energy consumption, hence fossil fuel usage has increased, as have unwanted greenhouse gases, including carbon dioxide, which results in critical environmental concerns. This book discusses this growing problem, aligning carbon nanomaterials as a solution because of their structural diversity and electronic, thermal and mechanical properties. Cheng-Te Lin serves as a professor at the Chinese Academy of Sciences’ Ningbo Institute of Materials Technology and Engineering. He has extensive research experiences with graphene and various carbon materials, as well as the development of biosensor and energy applications. Dr. Lin has strong experimental skills in nanomaterials synthesis and characterization. His areas of specialty include Graphene, 2D Atomic Materials, Carbon Nanotubes, Carbon Materials, Chemical Vapor Deposition, Chemical Synthesis, Graphitization Furnace, and Electrochemical Systems. Yan Wang, Ph.D., is an assistant professor at the University of Nevada, Reno, Mechanical Engineering Department. He was the lead guest editor for the special issue of “Innovative Nanomaterials for Thermal Applications” of the Journal of Nanomaterials and is a member of the American Society of Mechanical Engineers (ASME) and the Materials Reserach Society (MRS). Dr. Vinodkumar Etacheri is the Electrochemistry Group Leader at the IMDEA Materials Institute, Spain. He served as the Lead guest editor for the International Jounrnal of Electrochemistry 2016 special issue on Lithium-Sulfur Batteries and is a member of the American Chemical Society ACS); Israel Chemical Society (ICS), Materials Research Society (MRS) and the Electrochemical Society (ECS). Dr. Etacheri’s research interests include electrochemical energy storage, nanomaterials and solar energy conversion. Dr. Rajiv Paul is a senior post doc research associate at Case Western Reserve University. In addition to his research, Dr. Paul also serves as an adjunct assistant professor with the Department of Physics at the Heritage Institute of Technology. Dr. Paul holds a Ph.D. from Jadavpur University, India. His current research interests include: Carbon based nanomaterials for various energy storage application; development of innovative three dimensional (3D) and highly porous carbon materials for energy harvesting and storage; synthesis of efficient catalysts for electrochemical energy storage and conversion; elective functionalization of graphene and carbon nanotubes for efficient catalytic; and boron-Carbon-Nitride (C-BN) materials in different forms (3D, thin film, nano sheet, nanotube, nano-petals) and their characterization towards thermal and solar and electrochemical energy storage.